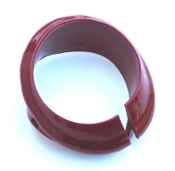 Molded red plastic rubber steering gear jacket tube cover to steering column filler trim. This trim goes between the steering column and the dash. For 1968 AMC AMX / Javelin models with red interior.